Late last night, Chicago police issued a community alert to warn North Side residents about a robbery crew that is working out of a stolen gold-colored Honda minivan bearing Illinois license plate H855843. As we reported on Saturday, police are saying that a robber has been emerging from the vehicle to forcibly take women’s phones and purses. 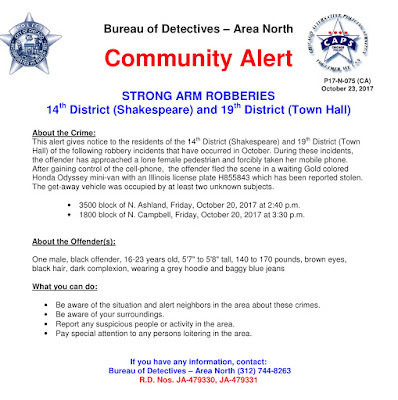 The police alert mentions two incidents from Friday afternoon, including the 3 p.m. mugging of a Lakeview mom near Ashland and Cornelia as she was walking to pick up her kids from Hamilton School. An earlier robbery in the 800 block of West Aldine is not included because, a source said, the victim has not filed a police report. According to reliable information, two witnesses reported seeing a long-haired, blonde woman get mugged near the intersection of Aldine and Dayton around 1:50 p.m. on Friday. Both witnesses called 911, but the victim reportedly fled the scene before police arrived. Aside from the alert, a police source said the minivan may now have a broken rear window and a stolen temporary license tag. Police said the primary offender is a black male between 16- and 23-years-old. He’s about 5’8” tall, weighs 140 to 170 pounds, and was wearing a grey hoodie and baggy blue jeans. In addition to the robberies in our area, the community alert says the crew robbed a woman around 3:30 on Friday afternoon in the 1800 block of North Campbell. Anyone with information about these incidents is asked to call Area North investigators at (312) 745-6110.